In the textile design student competition ‘Gestalten mit textilen Materialien 2007/2008’ (working with textiles), sponsored by the Department for Culture and Education, the first prize in the school category was awarded to Robert-Schuman-Realschule. Assessment criteria were the quality of the design concept, the execution and the originality of the work. 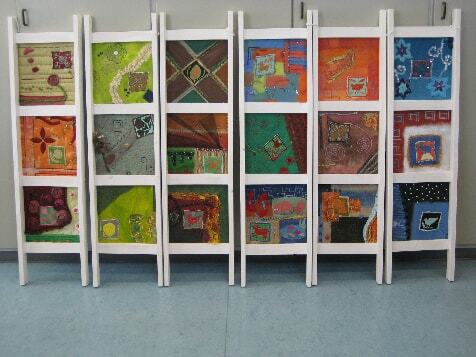 Textile works by 75 schools in Baden-Württemberg were submitted and judged by a selection panel. Due to the large numbers of entries it attracted, the competition was perceived as a great success by the Department for Culture and Education – free textile work is considered to make an important contribution to the development of motor skills and intellectual abilities in children. In the secondary school category, the work of year 10 students was particularly outstanding. The competition was launched in cooperation with the Fachverband Textilunterricht (association of textile teachers and lecturers) and with the Initiative Handarbeit (a needlework initiative). Year 10 students in Achern studied the embroideries of Afghan women and girls as part of a course on humans and the environment. 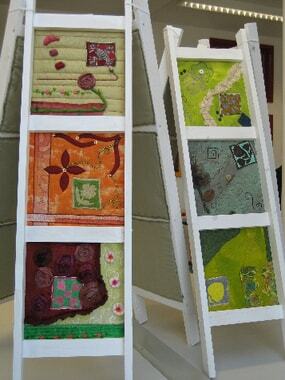 Textile artist Pascale Goldenberg from Freiburg was the inspiration behind these avtivities. Inge Morlok, Rosi Seigel and Nadja Szymanski, secondary school teachers from Achern, purchased embroidered squares for their 28 students from her. First the year 10 students dyed fabric squares of 30cm x 30cm, then the Afghan embroideries were sewn on by hand. The students succeeded in integrating the squares into their work in creative ways, adding fabric strips, embroideries, beads, sequins and buttons. Students from the nature & technology course got involved in the project, making ladders measuring 120cm in height from roofing timber as support structures for the presentation of the textile work. The winner`s certificate as well as the prize money were presented to a delegation of students and teachers at the regional council in Karlsruhe. The work was exhibited in May and June in Freiburg and subsequently in Stuttgart until September.